Bing Satellites - Twilight Sessions volume 13 - BFW recordings netlabel - ambient shoegaze indie experimental electronica - music is free! 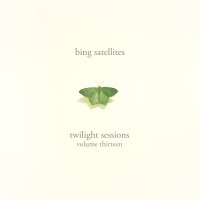 The thirteenth volume of Twilight Sessions by BFW founder Bing Satellites. This album is a selection of live, improvised recordings. This is especially true in this album. I started only one song (Outside) with a particular key or scale in mind (E phrygian dominant, if you really want to know), and even then, the key changed to something slightly different (A harmonic minor - same notes but with the root note being A and not E) as the song progressed. This is a very inspiring and liberating way to create music - I can express myself in ways I never could with words or traditionally written pieces of music. The cover features a large emerald moth with landed in my bathroom one warm evening. They are quite common, although they don't usually stand out so much from their surroundings.